One of the most important tasks for a reliable operation of reformer furnaces is the integrity of the reformer pipes. The early detection of expansion and micro-cracks using Reformer Services proprietary OD and ID inspection systems can lead to improved reformer tube knowledge and operation. The diameter is the measurement by laser for expansion and is performed simultaneously to the proprietary 360° eddy current crack detection. Reformer Services is the first and only company to offer clients a full 360° coverage for crack detection on both the ID and OD of your reformer tubes. 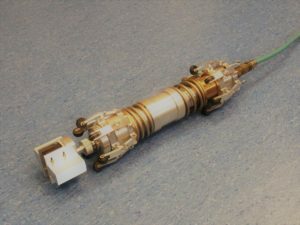 For testing from the internal surface, a rotating probe equipped with a powerful proprietary eddy current probe and simultaneous working laser. 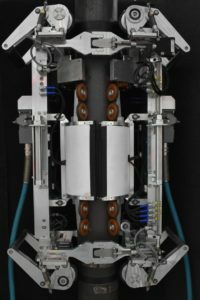 For data acquisition, the probe will be pulled by a motorized winch ensuring a constant scanning speed and complete scanning of the pipe surface. The Reformer Tube Scanner type Tube Scan-360-ID is equipped with a powerful proprietary eddy current probe for sensitive crack detection in reformer tubes up to 23mm wall thickness. As this proprietary technique needs no couplant, the readings are repeatable from one inspection to the next inspection. Both measurements expansion and crack detection are carried out simultaneously during the inspection. During each tube inspection, millions of data points are collected on each tube. With this data, we will perform a level 1 assessment on each tube and present this information in a report before leaving the job site. Afterwards, a final inspection report will be completed and sent to the client with all tubes chart overviews. The Reformer Tube Scanner type Tube Scan-360-OD is equipped with a powerful proprietary eddy current probe for sensitive crack detection in reformer pipes up to 23mm wall thickness. As the proprietary technique needs no couplant, the readings are repeatable from test to test. Both measurements expansion and crack detection are carried out simultaneously during the inspection. During each tube inspection, millions of data points are collected on each tube. With this data, we will perform a level 1 assessment on each tube and present this information in a report before leaving the job site. Afterwards, a final inspection report will be completed and sent to the client with all tubes chart overviews.